It's no secret that daughters seem to bear the brunt of caregiving duties for elderly parents, but a new study suggests that conscientious daughters often fill the gaps left by sons. "Sons provide a lower relative share of total parent care if they have a sister, whereas daughters provide a larger relative share if they have a brother," said study author Angelina Grigoryeva, a graduate student with the department of sociology at Princeton University. "This finding suggests sons may pass on parent-care responsibilities to their sisters." Although the study was not designed to discern why this may be so, Grigoryeva suggested that women are often raised to be caregivers and that when the elderly parent is a woman she might not feel as comfortable with her son taking care of her. The study also suggests that the gender divide remains strong even as men do more housework and spend more time on child care. "Gender inequality in elder care is more pronounced than in housework or child care," Grigoryeva said. As of 2006, almost 11 million older adults in the United States needed help with at least some tasks that are part of independent living, such as dressing and bathing, according to the study. "It is a well-established fact that most elder care in the U.S. is provided at home by unpaid family members, usually adult daughters," Grigoryeva said, but it's not completely clear why brothers don't contribute more. In the study, Grigoryeva examines statistics from a 2004 national survey of people over the age of 50. She looked at the results from about 3,000 parents with 1,477 sons and 1,537 daughters (one child each) and 2,461 sibling groups with at least one son and 2,488 sibling groups with at least one daughter. Among other things, Grigoryeva found that sons are most likely to step in to help elderly parents when there's no sister or spouse to help out. The findings also suggest that daughters provide more care to mothers, while sons provide more care to fathers. The study doesn't delve into why these differences exist, but Grigoryeva said they may have a lot to do with the caregiving role of women in society and the fact that most elderly parents who need care are women. "It is possible that elderly women in need of care resist the caregiving efforts of sons," she said. Marina Bastawrous, a postdoctoral fellow at the University of Toronto's Graduate Department of Rehabilitation Science, said her own research into caregiving has shown that daughters often "took on the caregiving role because they were the only female sibling and, in turn, their brother or brothers wouldn't do it. On the other hand, daughters who had female siblings often talked about a more even distribution of responsibilities." 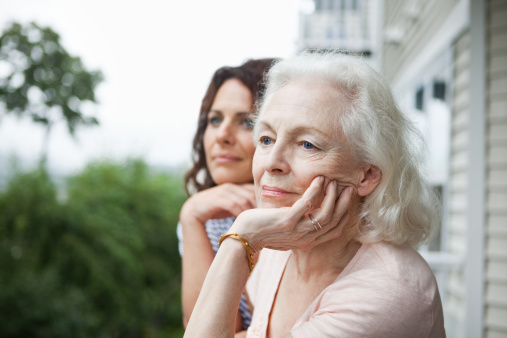 What should daughters do if they feel overwhelmed by caring for their parents? Grigoryeva suggested that daughters focus on tasks that brothers might be more likely to want to handle, such as home repairs and helping with bills. Bastawrous agreed that it can be smart to distribute tasks according to each sibling's strengths. Caregivers should also "seek opportunities for support outside the family. Caregiving peers can help relieve emotional stress just by talking to a caregiver about their own experience." The study is to be presented at the American Sociological Association annual meeting in San Francisco. The findings should be considered preliminary because they haven't gone through the review process required of research published in medical journals.